As at the time of writing this, it is almost that time of the year already. The Sydney Royal Easter Show will be on from the 10th to the 24th of April 2014. Do you go to the Easter show in Sydney at Sydney Olympic Park? Why/Why Not? I went last year, and I was able to write some articles for my work from it - when I was busy with my kids writing work. Was able to claim the entire day on tax. This year I won't go. It does get too expensive. Some families go every year, while some of us go once every few years. Yes, I have plenty of moola to go, but I choose not to. 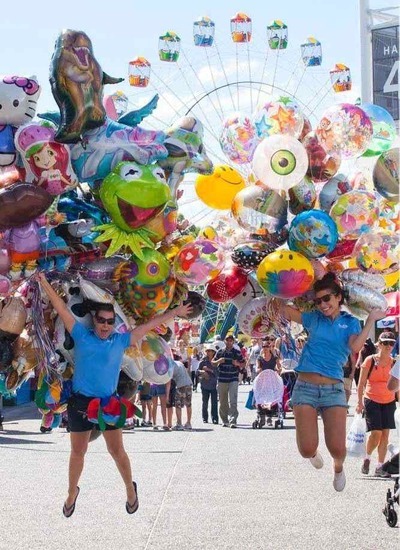 Ever since the age of two the Sydney Royal Easter Show was the place to be every Easter holiday. Almost 18 years later I still get the same sense of excitement going there! From when it was held at the old Sydney show grounds at Moore Park to now at Sydney Olympic Park, the Easter Show is still the greatest place to be during the March/April months. Although the prices are ridiculously expensive, it makes up for Sydney's lack of Theme Parks. If I had to sum it up in three(ish) words it would be rides, showbags and animals. For those who rant willing to sacrifice the extra dollar for entry, they offer discounted entry prices if you purchase online, if you go after 5pm and towards the end of the show period. I'm nearly 18 and I still love going to the Easter Show! Yes, it's very expensive but if you go on a day where it's not too crowded, or at night time then I think it's definitely worth it! I used to love going as a child - there was always so much to see and do, it was something I really looked forward to each year. The last time I went was probably in 2008 or 2009, and I don't think I would go again. It brings back really great memories, and I think I'd like to remember it that way; if I were to go now, I think those great memories would be spoiled and replaced with those of huge crowds, long queues and pushy people. It's definitely catered mostly towards children - with showbags, animals and carnival shows - all of which I can appreciate, but just don't have the enthusiasm for like I once did. Perhaps I'll go back when I have children of my own! I find that each age I pass through brings a different attitude toward going to the show. When I was a child it was all about the showbags and the junk food. As a teenager it was the rides and the sideshows. As a twenty something I looked for the freebies and samples. As a new parent it was about finding family friendly parts of the show and I began to take an interest in the home improvement stands. As the parent of a teenager and a uni student there is not a great deal of interest, but I am tempted to go back and just pig out on junk food and buy myself some frivolous crap from the market stalls. No, I won't go, with three kids to take it would cost me about $500 for everyone to get in and have a few rides and a couple of showbags each. I much prefer the alternative, Sydney Show, these days. We buy our tickets in advance, all the kids get an arm band for unlimited rides and there are showbags and food for sale just like at the Royal Easter Show. I do miss the agricultural stuff, but will have to go another year when I'm more willing to part with the cash. I went to the last R.E.S. at Moore Park, many years ago, then I went to the 1st 1 at Olympic Park. 2 years ago, & I haven't been since. In 2015, My husband & I went on a bus, 5 mins from our house, but when we got over there, it was pouring, & there wasn't any cover over the queue, & we didn't have umbrellas, so we came home on the same bus! Last year we were going, but I got the seniors 2 days mixed up in the wrong week, & missed them, so we'll try again in 2017. I love the wood cutting, cake decoration & the agricultural stands arts & craft & the flower displays, & I'd love to have scones & jam, with a cup of tea, that the CWA puts on. You know, I have NEVER tried those lovely looking scones, that lots of people seem to queue up for! Best place to buy kids clothes in Sydney? Best public art display in Sydney?